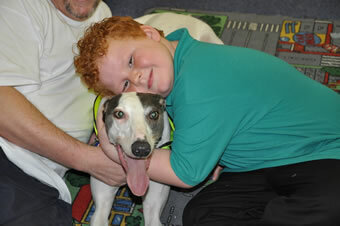 Transformed from a homeless stray to a recognized celebrity, Danny, a blue and white greyhound, celebrates his rags to riches story every day. 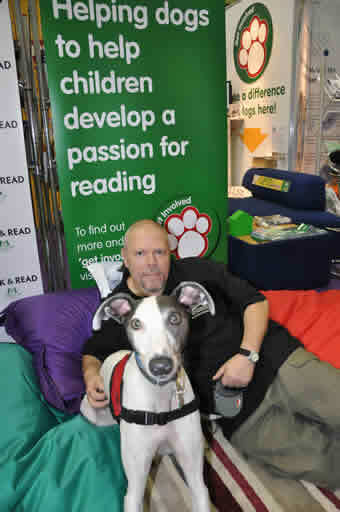 Rescued from wandering the streets of Cork, Ireland, Danny and his owner, Tony Nevett, now travel from their home in Northamptonshire to primary schools around the UK, transforming the lives of many children through the Kennel Club “Bark & Read” program. Bark & Read’s official logo. 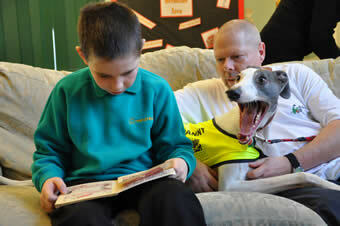 Referred to as “listening dogs” in the UK, the first trial was based in Kent and is now in two other counties. Tony is working tirelessly to bring the R.E.A.D. program to life in the UK. 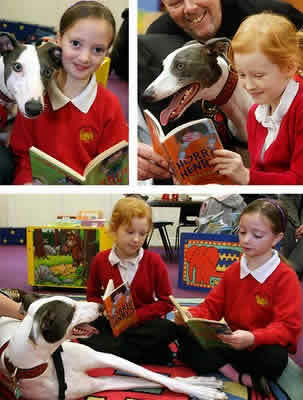 At a time when many councils are cutting back on library services, some are beginning to use dogs as an innovative way to help children get excited about reading. Danny has received much recognition and many awards, including his own piece on the BBC children’s channel. He has been on Sky, BBC, ITV, Fox, PBS, and CBS News programs; appeared in dog magazines worldwide; and he has been honored by the Greyhound Board of Great Britain. 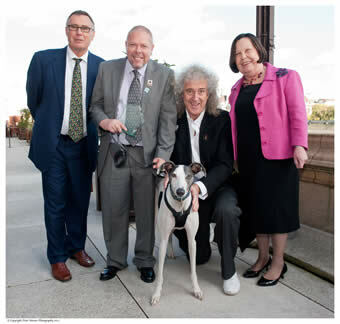 In October 2011, he and Tony celebrated Animal Action Week on the terrace of the House of Lords along with other award recipients and numerous animal lovers. Danny won The International Fund for Animal Welfare (IFAW) Amazing Animal award for his work as a listening dog, helping children improve their reading skills. Danny received his award from Baroness Gale and Brian May of Queen, at the House of Lords in London. Children who find it difficult to read appreciate the fact that Danny might twitch a paw, but he will not laugh; he might raise an eyebrow, but he won’t complain; he might even fall asleep, but he won’t give the kids a hard time if they stumble over a word.